When 11-year-old Rowan received a Justice League Chibis set for her birthday, the comic lover was disappointed to find that there were 10 male superheroes and only two females. "I also did not understand why the background for the girl superheroes was all pink, purple, and other 'girl' colors, but the boy superheroes got black, red, and dark blue," she told The Huffington Post. 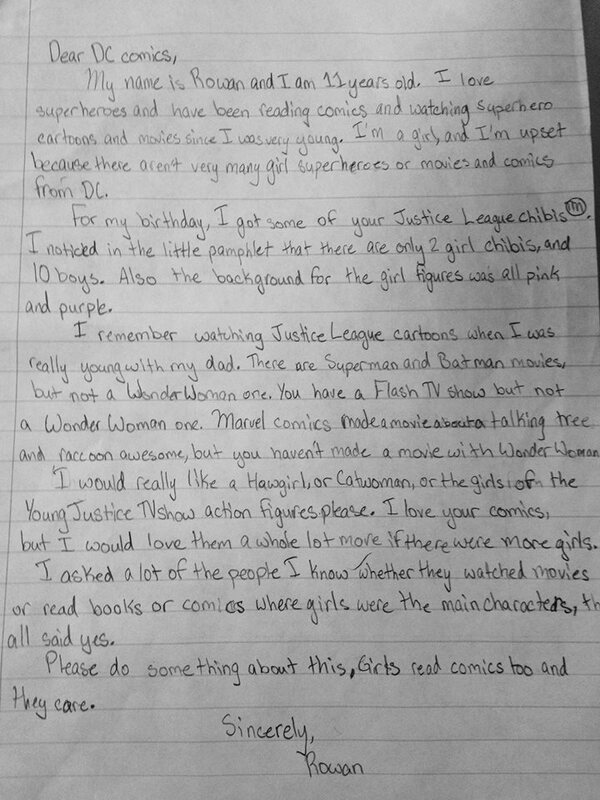 Frustrated, Rowan wrote a complaint letter to DC Comics. My name is Rowan and I am 11 years old. I love superheroes and have been reading comics and watching superhero cartoons and movies since I was very young. I'm a girl, and I'm upset because there aren't very many girl superheroes or movies and comics from DC. For my birthday, I got some of your Justice League Chibis™. I noticed in the little pamphlet that there are only two girl chibis, and 10 boys. Also, the background for the girl figures was all pink and purple. I remember watching Justice League cartoons when I was really young with my dad. There are Superman and Batman movies, but not a Wonder Woman one. You have a Flash TV show, but not a Wonder Woman one. Marvel Comics made a movie about a talking tree and raccoon awesome, but you haven't made a movie with Wonder Woman. After Rowan wrote the letter, family friend David M. Perry wrote a blog post about her words, which later went viral on Twitter. DC Comics responded to the letter on Twitter, though Rowan tells the Huffington Post she did not receive any personal email or mail from the publisher. Rowan is pleased that her letter made some waves, but she said she's upset that "there are some who are saying that did I did not write the letter, or even that I am not a real person. This really hurts my feelings. " Ultimately, the 11-year-old has one goal in mind: "I hope that DC (and Marvel too) will make a change. I hope that things will be different, I hope that people will see my letter and think 'Yeah! They really need to change that! ', and most of all, I hope that other people will write letters because I am not sure mine will be enough to make the change."